It was our first morning in Gros Morne. We had planned on climbing the mountain at some point on our trip, but figured that we would ease into it by having some shorter hikes first. Shannon had noticed that the morning was sunny and clear and had suggested to me that we should climb the mountain today. This being Newfoundland, there was no way of knowing how long we’d have the nice weather, and you really don’t want to navigate the top of Gros Morne in the fog or rain. Fed and caffeinated, I started coming around. It was indeed a beautiful day, and why not start or visit with a bang? Shannon smiled and ordered us a pair of the “hikers lunch” packs they (conveniently!) sold at the restaurant and drove out to the trailhead. 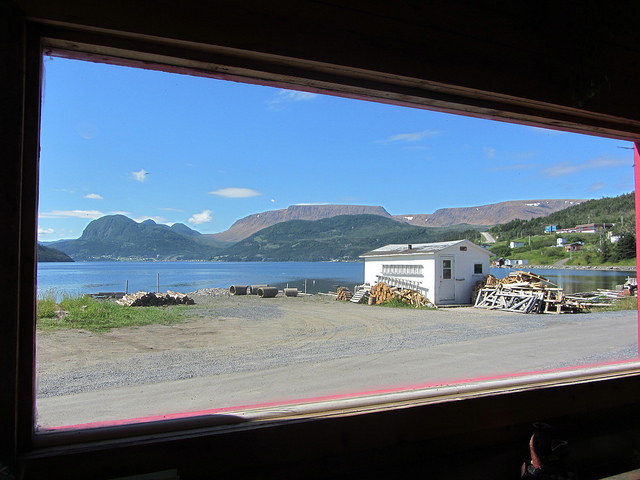 Gros Morne mountain is what gives the entire region its name, looming 807 meters above the fjords and villages. The origin of the name is foggy – literally, perhaps, since it might be referring to how the mountain looms lonely and mournful in the coastal mists. It’s more of a large hill rather than a pointy steep mountain, so climbing it wasn’t going to require any special mountaineer gear or anything – but we had heard that it wasn’t exactly going to be a leisurely stroll, either.